#12123, "Declaring Clear Lake Hitch Threatened or Endangered"
The Center for Biological Diversity is petitioning CA DFG to list the Clear Lake Hitch as threatened or endangered. 2. The hitch in Clear Lake declining in numbers substantially from the past. There's been several posts on WB and Calbassin about this topic and I sense some confusion from the angling community about what this means. 1. I think the Commission will list the Clear Lake Hitch as threatened, possibly even endangered. A reasonable person will look at how many hitch there are now compared to the past and know that something is going wrong. "The impact of largemouth bass on hitch populations should be carefully investigated and if bass are determined to be a major source of mortality, an action plan to reduce bass predation should be implemented. Possible measures could be protection zones around the mouths of hitch spawning streams through improved habitat and seasonal trapping and removal of bass." Anyway, it could be that CBD is adding this as one layer in the evidence, knowing that nothing is likely to be done which will make them look like they conceded something. It could also be that this item is in fact one of their most important mitigating actions and thus they listed it at the very end of the recommendations in an effort to hide it from view. We won't know which it is and likely won't find out. The issue is important though because what the CBD plans to push in terms of mitigations affects how bass fishermen should view this proposed listing. Most of what will happen if hitch are listed is great for both sides. But this one issue has a divisive aspect to it that could cause a lot of fighting. If the CBD is smart, they will realize a few things. Bass fishing, particularly tournament bass fishing, removes bass from areas where hitch school up year-round at clear lake. If you fished in the 2011 FLW Event last year like I did, and you saw how many boats were sitting on the hitch school mid-lake the first day and you realized how many bass got caught out of that hitch school over a several week period, you know for sure that tournament bass fishermen are helping hitch. Similarly, bass fishermen know that bass congregate around the mouth of the creeks where hitch spawn in the spring and catch thousands of bass using hitch imitating lures. A good portion of those bass, including the largest ones, are moved to other parts of the lake to be weighed in. All of this fishing activity occurs because bass fishing is GOOD at Clear Lake. If the CBD convinced FWS, DFG or some agency to net, shock or otherwise kill off bass at Clear Lake, the bass fishing activity would diminish. If DFG implemented regs like at Biwa in Japan to enforce mandatory catch and keep, tournament fishing would likely cease at Clear Lake altogether. And so the CBD is faced with a choice. A choice between the benefits of putting thousands of bass boats on the lake every year for bass tournaments vs. discouraging that activity and hoping that another method like regulation, or killing off the bass will have a better effect. If the CBD is smart, they'll drop the bass killing mitigations, convince bass fishermen that the rest of the mitigations are good for everyone and get bass fishermen on their side to have the hitch listed as threatened. If they don't see the whole picture of how tournament fishing helps hitch, they might make the bass killing issue the focal point of the discussion and fight a pointless fight to no one's benefit. Interesting, no? The issue will be discussed in front of the Commission Feb 6-7 in Sacramento. The agenda hasn't been posted yet. #12125, "RE: Declaring Clear Lake Hitch Threatened or Endangered"
I want to look into this some more. I will read some of the primary literature, and put in my two pennies. That said, right now, just having glanced over the petition, I think bass fisherman are not going to suffer from this. Hitch are like trout to the bass of clearlake, a large, spineless energy source that have not evolved any protection agains the predation of LMB. The CBD is now pushing for their protection, which means in an ideal world, their numbers will increase. We also know that it is basically impossible to wipe out an invasive predatory gamefish without killing the entire lake with rotenone. I worked with DFG removing Pike from Lake Davis with elctrofishing boats. Hundreds of pike a day for years didnt remove the population. Its been a similar story with a lot of green sunfish removal attempts, which are pretty close relatives of LMB. So knowing that removal of bass from clearlake is politically and biologically impossible for many reasons, I think they will just have to focus on habitat improvements and water quality and usage mitigation. Foe has become friend here, but folks are weary over the trout thing. Remember they are not out to get anyone. They are scientists who have devoted their lives to protecting fish, wildlife and the environment in general. They are not our enemies, rather, they are objective in nature, which means they may put forth ideas that we totally disagree with sometimes, and they may do somehting that is totally in our interest other times, such as increasing the number of hitch (something analogous to trout in a trout-free environment), in clearlake. #12127, "RE: Declaring Clear Lake Hitch Threatened or Endangered"
From everything I have read on Clear lake is that it has an enormous population of 4-7lb bass. Removing bass could definitely improve the fishing for top end bass, coupled with a probable increase in Hitch from all the measures, could make for some really special fishing. Also if less tournaments came to Clear Lake that would probably benefit the fishing too, from a boat traffic stand point. It wouldn't help the local economy but this is a fishing forum. Also can Hitch be breed in fish farms and stocked other places? From a surviving stand point not a legal or any other perspective. Hitch stocking could be pretty interesting. Re-stocking Clear lake with hitch and maybe other lakes. #12128, "RE: Declaring Clear Lake Hitch Threatened or Endangered"
Okay. Lots to say. Should just change my dissertation to this. First and foremost I think it will be supremely important that a collaborative effort takes place between the scientific community and the angling community. There is something incredibly important to both parties that is seriously at stake here: the Clear Lake Hitch. To the fishing community, the last unique biological aspect of Clear Lake is the Hitch. This is what makes bass fishing different here. There are entire economies based on the hitch; swimbaits made solely to represent the hitch; Tournaments that have been won by capitalizing on the hitch migration. It is a swimbait sized, schooling, smooth, spineless, fish not adapted to sit-and-wait suction feeding, large-mouthed predators. The ultimate food source for a thriving bass population. And until recently, it was seemingly inexhaustible. To those concerned with biodiversity, as we all should be as true outdoorsmen who seek the intrinsic value of being on the water, there is alarming concern for the loss of a unique entity. Clear Lake is an absolute power plant of a lake in terms of biodiversity and rates of endemism (species only found in one place). There were historically 4 fish that did not exist anywhere in the world except Clear Lake. The Hitch, may be the last if action is not taken. How can we restore the Clear Lake Hitch and why? As bass fishermen, it should be obvious that we need the Hitch, much like the bass in my home lake, lake chabot, need trout, if we want to maintain a trophy bass fishery. As a scientist, we need it because we are concerned about the rapid loss of aquatic biodiversity. The value of biodiversity is unmeasurable. There is economic value such as the bass fishing industry that is drawn to the trophy bass fishery that exists at Clear Lake. There is the ecological value that the Hitch plays a very specific part in the nutrient dynamics of the ecosystem, which can be traced if any willing scientists care to examine the stable isotopic signature of the Nitrogen fixation of the Hitch. And there is an intrinsic value to maintaining biodiversity. This can be felt when you look out off the kelsey creek bridge in the state park and see fish swarming by the thousands. Through collaborative effort. Removing bass is stupid. If anyone thinks the removal of a veracious predator from a lake this size is anything but quixotic, then they need re-examine the literature. Bass are here to stay. And for that matter, they would also have to take on the following veracious predators and pelagic food competitors: Bluegill, green sunfish, (occasional) smallmouth bass, black and white crappie, channel catfish, white catfish, carp, goldfish and Mississippi silverside. The eradication of just one of those would be nearly impossible without the use of rotenone. 1) Remove major spawning barriers on the currently important creeks such as Kelsey creek and Adobe Creek. Further, these creeks should be monitored to ensure that no illegal dumping or drawing of water occurs. This should be done by state agencies, but hell, whats wrong with doing a little vigilante justice if you live in the area? 2) Ensure that no water removal activities happen during the prime spawning months from the main tributaries. 3) Habitat improvement. We do it when bass are on the line, why not when the best food source of bass are on the line? Get the local bass clubs involved. 4) Ban any commercial harvesting of hitch, and enforce it. call cal-tip. DFG...respond to cal-tip calls! Here are a couple other suggestions. Get Tom Steinstra to write an article in the chronicle talking about the "famous and beautiful Hitch run" and watch the visitors and money pour in. I read an article about a little known trial near half moon bay once in the Thursday paper, went there Saturday and had to park a mile away from the entrance! that guy has an active audience. Build the Hitch up as an icon of Clear Lake, take the focus off bass fishing and put it on the habitat degradation, and watch things happen! Rob, great thinking with the tournament removal of Hitch predation. That is genius and exactly the reason groups like the CBD need to work with us. I am fizzling out now. Please keep a positive and active movement here. Dont be a contrarian or close minded like they think us fishermen so often are! #12134, "RE: Declaring Clear Lake Hitch Threatened or Endangered"
"I havent read through this issue too much but my knee-jerk reaction is this. Its going to be very difficult to prove that the so-called Clear Lake hitch is actually still present and genetically different enough from hitch to warrant 1) sub-species status and 2) protection under state or federal ESA's. I looked into this years ago and my conclusion was, based on available information, the Clear Lake hitch no longer exists genetically. Any remnant genetics still within Clear Lake are likely so diluted through introgression with the so-called regular hitch that the sub-species no longer exists. I honestly dont even think anybody even has genetic references for Clear Lake hitch (that is, fish collected many years ago that genetically were Clear Lake hitch; these samples would be the only means to determine, through comparison, if the genetics from hitch currently in the lake could be identified as the Clear Lake sub-species). So good luck to those pushing this listing, proving the sub-species still exists through genetics is going to be extremely difficult. And in the end it doesnt really matter, its not going to effect any of us as bass fishermen anyway." #12135, "RE: Declaring Clear Lake Hitch Threatened or Endangered"
Here is at a gene sequence from clear lake hitch that I found on Genbank. There are more. Im not sure why he thinks they are introgressed? I haven't read that anywhere? There is pretty good evidence that this is a unique species. Differences in the gill arches that would make sense for a more lake-oriented feeding habit as they are used in filering algea and plankton, and a deeper body, also often associated with slow and still-water environments. 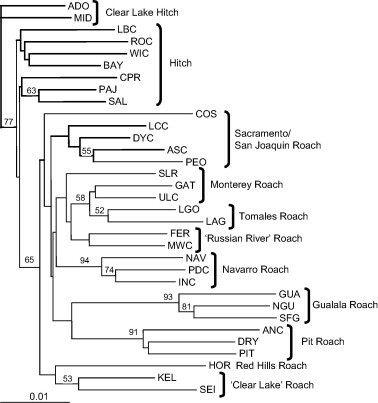 #12137, "RE: Declaring Clear Lake Hitch Threatened or Endangered"
Ok, there you go then! >are introgressed? I haven't read that anywhere? >There is pretty good evidence that this is a unique species. >with slow and still-water environments. #12138, "RE: Declaring Clear Lake Hitch Threatened or Endangered"
#12139, "RE: Declaring Clear Lake Hitch Threatened or Endangered"
Many years ago I gave up talking about biological issues with the general public, its not worth it. I still throw in a brief opinion on-line from time to time, but avoid any in-depth discussions. It would take too long to really explain this stuff and Id rather be out fishing. With that said I will say this. Im rusty on this issue, I did look into it in-depth years ago and as stated my opinion was that the Clear Lake hitch sub-species no longer exists (what does that mean? ; It means genetically its not pure enough to be legally designated as a separate species/sub-species; if you review all available info its not cut and dry). Nobody is argueing that the Clear Lake hitch isnt different from a regular hitch, because it is. I do believe I found information stating introgression likely eliminated the pure Clear Lake hitch genetics. Both hitch, regular hitch (Lavinia exilicauda)and Clear Lake hitch (Lavinia exilicauda chi), have been in Clear Lake for a long time. Do you honestly believe the two havent hybridized? The question becomes to what extent, and that is a hard question to answer. And finally, my answer is based on experience with issues of this type; hybridization occurs much more frequently than most people think. You hit the nail on the head when you asked what is the definition of a sub-species, and legally that issue is complex and Im not even going to attempt to answer that question. Youve provided a genetic sequence above, and being lazy, Ill just ask you instead of searching for the answer myself. Can you provide the sample information associated with the sequence above (when was it collected? ), and can you provide a sequence from a "regular strain" hitch so that we can see the difference? Then of course you will have to interpret such that we can all understand how pure the baseline CLH hitch is to the baseline regular hitch (but the reference sample from regular hitch must be a recent sample for it to have meaning). #12140, "RE: Declaring Clear Lake Hitch Threatened or Endangered"
Hey good to hear from you Urban! Ya, I usualyy dont get involved. Especially on ncbf. But I fell like this is a great opportunity to bridge the gulf that has been forming over the lats 20 years or so between fishermen and biologists. It used to be that biologists and ecologists and outdoorsman were one in the same, or at least had the same values. I think they still do but just dont realize it. Thats why i like this issue. #12141, "RE: Declaring Clear Lake Hitch Threatened or Endangered"
>threat,and in most instances their perceptions are completely wrong. >explain this stuff and Id rather be out fishing. That's because it's mostly a black & white world at westernbass.com and barely-understood concepts in science are only accepted if it supports their narrow worldview. #12142, "RE: Declaring Clear Lake Hitch Threatened or Endangered"
There are definitely a lot different views about conservation and preservation between a lot of us, but lets try to keep the focus on solving the issues through collaborative efforts. There are many driven and influential people in the bass fishing world on westernbass that, like us, stand to benefit from working together on restoring the hitch population in Clear Lake. #12143, "RE: Declaring Clear Lake Hitch Threatened or Endangered"
#12130, "RE: Declaring Clear Lake Hitch Threatened or Endangered"
Well, this will be sort of confusing without a total understanding of evolutionary biology, so bare with me. One of the most fundamental, yet widely disputed concepts in biology is what is a species? Unfortunately, for years and years, the convention was that a species is a set of organisms that can reproduce to create fertile offspring. Well that�s just stupid. Different species of sunfish do it. Hell, Hitch probably do too. But we know that a green sunfish is not the same species as a bluegill. Countless plants do it too. I am actually starting to get involved with in the philosophical debate over species concepts, and have spent a lot of time reading and discussing the issue. I feel that the best definition of a species is that it is an entity comprised of organisms that maintain genetic cohesion through time. This accounts for asexual reproducing species, and hybridization. Hybrids exist in nature, but rarely. Why? 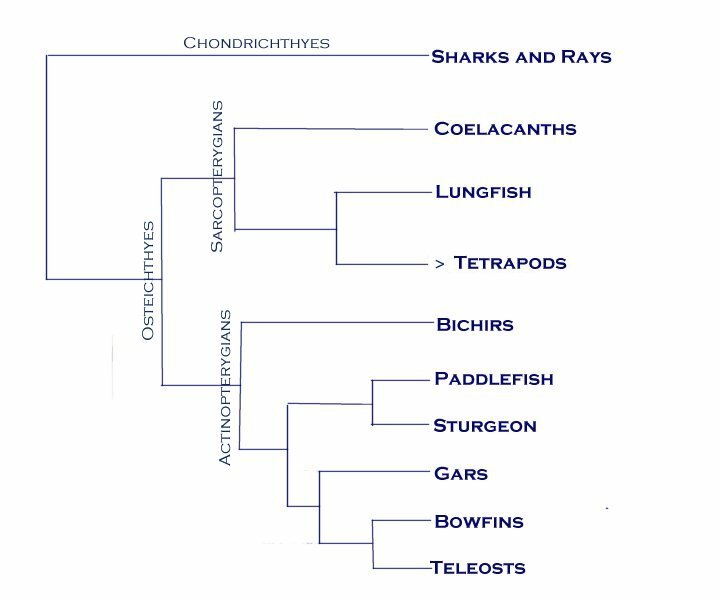 Because if they hybridized all the time indescriminantly, they would just be a species, they would not show two distinct lineages through time � there would be no green sunfish or bluegill, their would just be their hybrid. Anyways, so the thing that people don�t like about that species concept is that any time that the best evidence shows that there is genetic isolation occurring, it may be a new species. So, technically, if you can bring forward evidence that bass in one lake will never share genetic information with bass from another lake, one could potentially name it a new species. That�s taking it a little far, but a good example is a fish im working with right now. A suckerfish that was in the Rio Grande basin, but maybe 20,000 years ago the headwaters in mexico were captured via geologic activity, and now belong to a pacific draining river. They are genetically isolated, and arguably a new species that diverged from the Rio Grande lineage. I would also like to mention, most organisms do change over time. A coelacanth from 100,000,000 years ago, I bet, it genetically way different than one today, probably morphologically as well. Things change as environments change. Also just randomly. If a mutation occurs that is neither beneficial nor deleterious, than it can easily become fixed in the species over time. This is called genetic drift. Sometimes a random trait like a set of pigmentation on the body somewhere might be linked with another gene that is more important, and thus this random gene hitchhikes through evolutionary time with the important gene. Which of those pieces of progress (shouldn�t say progress necessarily, it�s a random response to a changing environment, not a purifying or constantly improving process) is considered an element of biodiversity? I would say whatever one is alive at the time. We are limited in our abilities to understand biodiversity in that we only have the current snapshot of it. The question of which element of biodiversity is of greater value is where my objectivity as a scientist ends, and my personal politics began. But personally, I believe that the hypothesis of a novel species is more supported when there is a relatively long-term evolutionary background. This can mean thousands of years for vertebrates, while only a few weeks for bacteria. Its relative to generation time. A man made pond with a distinct variety of mosquito fish doesn�t do it for me. Although under the species concept I mentioned it may be argued that it is a new species, I don�t think there is any value in recognizing or protecting it. I feel that there is a functional role to natural elements of biodiversity. Every organism is like a cog in a machine. You can trace energy through systems and find that every organism plays a unique role in uptake and redistribution throughout the system. When a lot of dams in CA were built, the soils far up in the hills became deprived of a certain isotopic signature of Nitrogen that came from salmon. Because the salmon were food to bears, and we all know the answer to the age old question, Does a bear #### in the woods?. In summary, biodiversity can be assumed to be current snapshot of species that are extant (not extinct) today regardless of how they may have changed and will continue to change over time. The divergent patterns of evolution will continue to cause genetic isolation in a variety of ways, as we move forward through time. The best we can do to classify units of biodiversity (species) is to make hypotheses that certain sets of organisms are maintaining themselves as a cohesive groups through time. When these hypotheses are falsified, then we reevaluate the group and make a new hypothesis using current information. I hope this was somewhat useful? #12132, "RE: Declaring Clear Lake Hitch Threatened or Endangered"
I read a fish caught in time in one sitting! Loved that book. Ya, the Hitch is definitely not as charismatic as say, a golden trout. But the internal workings of that group of fish is pretty cool! They have great acoustic communication. Their swim bladder is like a drum that sends vibrations like a telegraph through a weird series of bones, up through 4 vertebrae and into the auditory receptors. They also have crazy teeth inside their throat and a hard surface with which they pound or scrape the teeth to make the noises that they communicate with. I am totally in the school of thought that there is just an intrinsic value to biodiversity. Its unfortunate, that not everybody thinks that way. Luckily, there is a logical and utilitarian backbone to preserving biodiversity. #12133, "RE: Declaring Clear Lake Hitch Threatened or Endangered"
I did not realize this but it is no surprise that the Hitch are exploited. How legal is it to pump water out of a public lake? This definitely should be banned. Is there a large market for harvested hitch? There needs to be a moratorium placed on hitch immediately. Before the dfg does extensive research, kill bass, etc. they need to lessen/stop human exploitation FIRST. Also those seasonal roads that are packed up need to be outlawed as well, sickening that for a few months of driving convenience a species of fish is adversely affected and I am sure other repercussions occur. This is a really interesting thread to read, I enjoy the fish talk a lot. #12136, "RE: Declaring Clear Lake Hitch Threatened or Endangered"
To answer your question about the exploitation, I would say it is probably not a huge impact. Wester diet has left the minnow family in the dust really, leaving only asian markets. And really, they can often get carp, goldifsh, carpxgoldfish hybrids, blackfish, splittail and others for cheaper. Only 3-4 commercial licenses are issued for the harvest of minnow - mainly the Sacramento blackfish, and Hitch are required to be released now. #12144, "RE: Declaring Clear Lake Hitch Threatened or Endangered"
>minnow family in the dust really, leaving only asian markets. How big a factor is the "summer" roads that are bulldozed up almost like a dam? How prevalent is stream pumping and stream bed gravel mining? I don't understand how the dfg writes a relatively long report about hitch where they make overtones to killing bass and I assume they will be doing costly evaluations of clear lake and it's hitch, when it seems like any decline of hitch or extinction of the clear lake hitch sub species is from commercial abuse of the clear lake resource. Before anymore money is spent evaluating anything, put a bunch of restrictions on those activities and wait to see what happens. Whether it is fish markets or gravel companies or water trucks. It is that mentality of taking from a resource until that resource is depleted and then moving on to the next best resource, and begin exploiting that one. Commercial fisherman complaining about oil spills and other environmental roles really annoys me because if the fish/shrimp/crabs did not die from the oil they would just have been raped by the fishermen, the only reason the commercial guys are complaining is because it is hurting their bottom line. 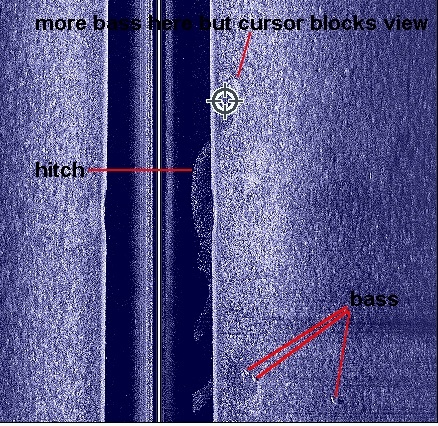 I actually think shocking bass and killing/relocating them is a good idea for the trophy fishery but they want to do it for the hitch, which Swimbait already said is not actually a help since tourney anglers camp over hitch schools and move the bass to weigh-ins, hindering hitch predation. Killing one species to help another one is inherently wrong for a variety of reasons. Ryan/MB said that you cannot take enough of any species out to make a noticeable difference, like must kill pike fishing or striper fishing. Sets a bad precedent to solve all your problems by killing fish, like say killing bass because it is affecting native trout in some lakes, or a bunch of other fish because something is eating them. Diminishes biomass in the lakes or rivers. Diminishes certain fisheries, tougher to catch 3-7lb bass in clearlake when a bunch are taken out. Promotes over harvesting even if it is deemed "bad", can be carried over to other species like put and mandatory take of trout, the trout anglers also keep whatever else they catch like say 18 pound bass, bluegill, etc. I am sure all of you have seen big bass harvested by trout fishermen because that is what they instinctively do from catching stockers their whole lives. #12152, "RE: Declaring Clear Lake Hitch Threatened or Endangered"
Ryan, your input here is invaluable. The most common reaction in fisherman is to react to protect traditional habits when conservation issues come to the table. I'm personally lukewarm on most my feelings on the CBD, but thats another topic. I think the DFG isn't going to put eradication on the table, as most reasonable folks seem to agree. Millions of dollars come from bass tournaments in Lake County. In many ways, its one of the few economies left in a rural area. Only fools would want bass to go away, and your point about Davis Lake and pike is right on. Not to mention, eliminating predatory species in one of the largest lakes in the Western US would be extremely difficult to achieve. Orchards are biological warzones. Much of the land on the north side of the lake where the hitch spawn is surrounded by pear and apple orchards. Orchards require an immense amount of pesticides to be viable. I think it likely that enough pesticides could deteriorate the fertility of hitch spawning streams. Further investigation of pesticides should be held. As said before gravel blockage for stream crossings is a backward step. Most of these creeks are small, especially Kelsey and Adobe. I think a well thought out infrastructure plan for small bridges is viable. A carefully designed bridge can present a very small barrier to fish migrations, vs. a gravel dam. What happens if you get rid of bass? Bass are predators, and efficient ones at that. But hitch are just part of the basses' diet. Silversides are extremely prolific at Clear Lake, and arguably a bigger threat to the hitch as they both compete for the same food sources. Bass at Clear eat far more silverside per annum than they do hitch. Would taking one source of predation out of the equation only increase the risk from silversides? And more importantly, where do protected species like Clark's grebes fall? I'm willing to bet grebes and other native birds capitalize on both juvenile and adult hitch alike when they can. #12153, "RE: Declaring Clear Lake Hitch Threatened or Endangered"
Well put! Food webs, a more detailed scheme of energy flow through an ecosystem than the classic food chain, are so intricate and complicated. Removing a major predator like the bass could very well, as you pointed out, hurt hitch populations more than help. Im glad we are getting this all down on this forum, in case the day comes where we need to put forth an argument to help keep Hitch rehabilitation projects in line with everyones interest. #12173, "RE: Declaring Clear Lake Hitch Threatened or Endangered"